Welcome to the Center for Cognitive Brain Imaging. Our Center strives for scientific innovation in the use of brain imaging to better understand psychological processes. The focus tends to be on processes associated with high-level cognition, such as language comprehension, visual thinking, social processing, multitasking, and executive processing. The general research goal is to develop a unified theory of cognition that is driven by and accounts for the brain activation in the cortex, at the level of large scale neural networks that perform cognitive computations. The goal is to explain how thought emerges from brain function and how it is affected by brain dysfunctions. Our fMRI studies use state-of-the-art scanners to capture brain images during high-level cognitive processes and use advanced computational techniques to explain the workings of the underlying complex dynamic systems. The brain imaging focuses on the use of fMRI to measure brain activation, but it also extensively uses diffusion-weighted imaging to assess the white-matter pathways that interconnect the cortical processing centers. These cortical centers function collaboratively to produce thought processes. The computational methods include the application of machine-learning techniques to fMRI data analysis and neurocognitive modeling of brain activity as it occurs in conjunction with cognitive activity, using the 4CAPS modeling system. The investigations also include several other empirical approaches used in conjunction with fMRI studies, most notably, behavioral studies and therapy studies of people with brain dysfunctions. The main applications are to the understanding and treatment of brain dysfunctions and to the enhancement of human performance in high-technology environments. Some of frontiers that CCBI projects explore include the neural representation of individual concepts, the neurological underpinnings of autism, and the dynamics and individual differences of cortical functioning, particularly as they are varied by rTMS. 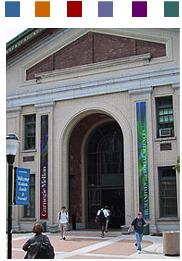 The CCBI is located at Carnegie Mellon, but much of the work is collaborative between Carnegie Mellon and the University of Pittsburgh. The CCBI uses the scanning facilities at the Scientific Imaging and Brain Research (SIBR) Center on Carnegie Mellon University's campus, which opened in May 2010. The SIBR Center has a Siemens 3T Verio, which has a large bore, providing more comfort to participants. Click the menu to find out more about our research projects, people, software, and publications.